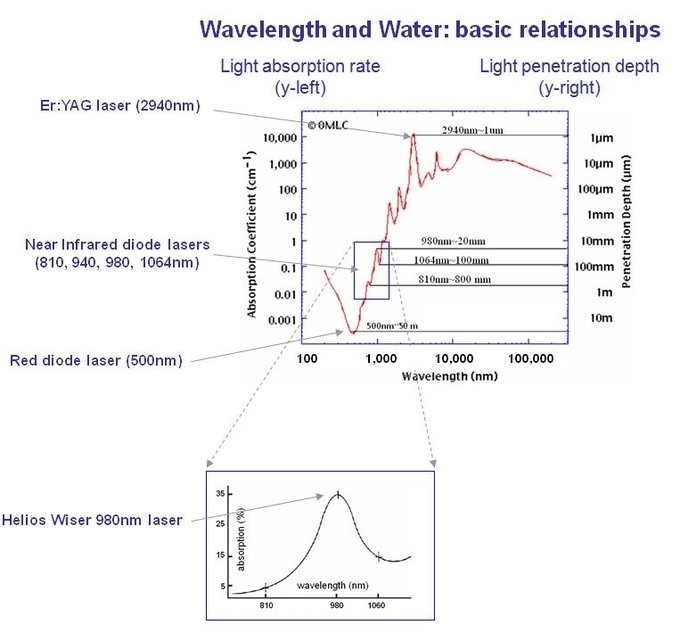 Diode laser energy can be applied superficially, as well as in open and endoscopic surgery. Thin flexible fibers deliver required amounts of energy into the body in a minimally-invasive technique. Both cutting and coagulation are performed in a single step reducing bleeding and decreasing necrosis as compared to other surgical techniques. Patients experience less pain, faster healing and quicker recovery. Many procedures can be performed without general anesthesia, reducing surgical risk as well as treatment time and cost. Being absorbed by hemoglobin as well as water, this wavelength is optimized to allow resection of highly perfused tissue and simultaneous coagulation of the adjacent vessels. The excellent hemostatic effect of the 980 nm laser light leads to significantly reduced intra-operative bleeding and reduces patient and physician stress. We provide you two years warranty for the laser device and one year warranty for hand pieces and fiber Optic Cables from the date of shippment. Ease of Use: Low space requirement due to compact design, the Dimed Laser is ideal for any setting not requiring special power or water as may be needed on some laser systems. The state-of-the-art high resolution color touch sensitive display provides a quick and easy interface to all system functions. Cost Effective and Higher Efficiency: Dimed Lasers use advanced diode technology that provide longer operating life and easy maintenance. The lasers are Self – Calibrating and designed to provide years of constant and reliable use. Multiple Surgical Capabilities: Laser surgery improves many surgical procedures by making them simpler and reducing risk. This enables surgeries that are not practical with conventional methods. Enhanced Visibility of the Surgical Field: The Dimed Laser seals capillaries and small blood vessels as it cuts, thereby dramatically reducing bleeding. This results in a much clearer and drier surgical site. removal of relatively large tissue amounts, or adjusted to remove only one cell layer at a time. Reduction of Surgery Time: The hemostatic effect of the Dimed Laser and the improved visibility of the surgical field often reduce the duration of the surgery.